SPOILER ALERT: Key “Munich” plot points are revealed in the article below. Who would’ve thought that between a gay cowboy movie and a Steven Spielberg thriller, the latter would prove more controversial? Of course this isn’t an ordinary Spielberg thriller. This one focuses on Israel (and isn’t exactly “Exodus”), and the ways a country responds to terrorism (and isn’t exactly “Air Force One”). The first and loudest shot against “Munich’s” broad, nearly three-hour-long bow came from Leon Wieseltier, who, though he is the literary editor of “The New Republic” and a vocal supporter of the Iraq War, isn’t exactly a movie critic. If anything he recalls Yakov Blotnik, the janitor in Philip Roth’s short story “The Conversion of the Jews,” who divides the world into what’s good-for-the-Jews and what’s no-good-for-the-Jews. This Spielberg movie? Wieseltier feared it was no-good-for-the-Jews. Or for the neocons. Wieseltier writes that Spielberg in his films “must ravish the viewer” and then he proceeds to ravish the reader with alliterations: a master of “slick searings,” he says of Spielberg; “soaked in the sweat of its idea of evenhandedness,” he says of the film. Here’s my version of evenhandedness. Wieseltier gets off some good lines, particularly when he says “...the only side Steven Spielberg ever takes is the side of movies.” Certainly I’ve had my problems with Spielberg in the past. But for “Munich” to be truly even-handed it would have to divide its storyline between Israelis and Palestinians, and it doesn’t nearly do this. The five Mossad agents who aren’t Mossad are all likeable. They sit down to home-cooked meals. Some critics have a problem with this (too cute), but the agents also bicker (a problem for other critics, who want action), and their retribution isn’t clean in the way of most thrillers (ditto). When the first Munich terrorist, carrying a bag of groceries, is confronted in the lobby of his old Italian apartment building, our protagonist, Avner (Eric Bana), fumbles for his gun before shooting the unarmed man. One thinks back to James Gandolfini’s speech in “True Romance” about how killing your first victim is tough but by the third victim it’s no big deal and eventually you do it just to watch their expression change. You wonder if these guys will become that way, but each reacts differently to the violence they do. The two extremes are represented by Robert, the bomb maker (Mathieu Kassovitz), who feels Jews don’t act this way, and blonde-haired and blue-eyed Steve (Daniel Craig), who feels the only blood that matters is Jewish blood, and who develops a taste for the kill. But no matter which character you relate to, you’re emotionally embedded with these guys. Meanwhile, the Palestinians get a small speech in a back staircase, with Avner glaring at the speechmaker all the while. This is Wieseltier’s “evenhandedness.” One speech. I imagine the bigger problem for Wieseltier is that the terrorists are humanized rather than demonized. They buy groceries. They have children. They talk with strangers on apartment balconies. The one prototypical Arab terrorist is killed, we are told in an epilogue, long after the movie ends, so we don’t get the cheap thrill we usually get when a Hans Gruber or an El Sayed Jaffa dies. There is only cold comfort. Wieseltier also complains about how tedious the film is. “For long stretches it feels like ‘The Untouchables’ with 11 Capones,” he writes, and I know what he’s talking about. I had moments like this myself, but it has less to do with what happens on the screen than what might happen on the screen. The first two killings take a while and you think, “How can there be nine more of these?” Answer: there isn’t. The further our heroes get into the story the less certain everything becomes. “Can I trust my source — is he giving me the right information?” becomes “Can I trust my government — are they giving me the right information?” Things break apart; the center doesn’t hold. Members of the team fall off. Five becomes four becomes three becomes two. At the same time the narrative breaks apart. Long set scenes disappear; we get quick cuts, snippets, dissonance, reflecting Avner’s increasingly paranoid state-of-mind. There is artistry in this. What began with clear loyalties ends with divided ones. What began with certainty ends with uncertainty. So, yes, it’s meant to relate. You could even say that we in the U.S. have already followed Avner’s arc — from certainty and clear loyalties on Sept. 12th to uncertainty and divided loyalties today. The questions the agents ask themselves are the questions we are asking ourselves. Are we doing any good? Are we actually making things worse? Is our government feeding us accurate information? And: Are we attacking the right guys? Other critics have complained that Spielberg, and screenwriters Tony Kushner and Eric Roth, are in fact championing pacifism. Variety’s Todd McCarthy, for example, takes them to task for creating “a work that espouses rejecting an-eye-for-an-eye in order to give peace a chance.” This is a misreading — there’s no such espousal in the film — and it misses why the film is great. “Munich” is a true tragedy because within the confines of the story you can’t imagine Avner (or Golda Meir, for that matter) acting differently, and yet it still ends the way it ends: with death and doubt. Avner does his job, and he does it well. You could even say he “wins.” Israeli soldiers regard him a hero. His boss wants him back. And yet it ends the way it ends: with death and doubt. The feeling at the end is similar to the feeling at the end of that great American tragedy “The Godfather,” where, though Michael wins (he defeats his enemies), he still loses (he loses his soul). There is no victory. Does Avner lose his soul? No, but it becomes divided. As the film progresses, killing becomes easier for him, although he always has to work himself up to it. He needs hatred to kill — you can see it in his eyes — but the hatred takes its toll. A few critics have faulted Bana’s performance and/or Kushner’s script. They want to know what’s going on inside Avner’s head as it’s all happening, but such a wish would’ve ruined the film. Instead the filmmakers gave us a man doing his job, and doing his job, and doing his job, and then in one instant, when he talks to his baby daughter over the phone, we see how much it has cost him. 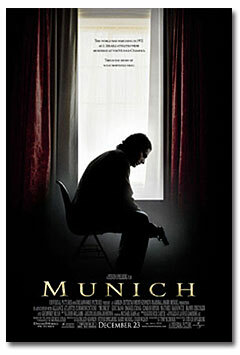 “Munich” is not a perfect movie. Everyone agrees that intercutting the massacre of the Israeli athletes with Avner’s love-making was a serious error. The final shot was also unnecessary. As Avner walked with the New York City skyline behind him, including, eventually, the World Trade towers, the camera should have followed him and faded out; instead it ignored Avner and stopped with the towers in center-frame. Spielberg is always underlining points that would be more powerful without his help. There is also some confusion about who or what Avner is fighting for. He’s a dutiful child of the kibbutz; his wife says the state of Israel is his mother. Yet, early on, he tells his wife that she — not Israel — is his home. In fighting for Israel he loses Israel — that’s one of the film’s ironies — but if his wife is really his home shouldn’t he lose her, too? The lines aren’t as clean as I want them to be. Even so, “Munich” is the best movie of the year. It articulates the most troubling issue of our day in a way that is personal and powerful. It is bold enough to give us fewer answers and more questions the more we watch, and to leave us with the sense that much of life is unknowable. And — not least — it reminds American audiences that international terrorism didn't begin with 9/11; this fight has been engaged for decades. Unfortunately it’s doubtful whether the film will get the broad audience it deserves. It’s the kind of movie that needs awards to get butts in the seats, but both the Producers and Screenwriters Guilds passed it over, and there is now worry over the Oscars. Since it’s also the type of film that usually wins awards by the bucketful — epic, resonant, not to mention the most mature work by the most popular director in the history of movies — one wonders what’s going on. Which is to say: Hollywood is full of Yakov Blotniks. —Erik Lundegaard’s favorite Philip Roth novel is “The Ghost Writer.” This piece was originally published 1/31/2006 on MSNBC.com.